Shiloh Cemetery has long been a place of rest. The first recorded burial took place in the shadow of the area’s Methodist Church in October 1850. The church burned in 1867 and was relocated to Windsor, leaving the cemetery uncared for. In 1885 a maintenance association was formed but into the 20th century burials happened haphazardly. In 1937 voters authorized a cemetery district and the cemetery was surveyed in 1940. Since the 1950’s the district has made many improvements with consideration given to retaining the history of the cemetery. This is the final resting place of several Brothers of ECV, including Jerry Barndt, widely known in the Bay Area as Emperor Norton II. Erected 2005 by Sam Brannan Chapter #1004 and Yerba Buena Chapter #1 E Clampus Vitus. traveling north. Touch for map. 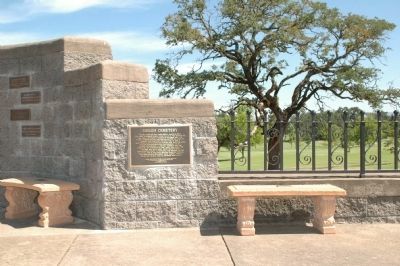 The plaque is mounted on a memorial wall in the center of the Santa Rosa Memorial Park - Shiloh Addition. Marker is at or near this postal address: 7130 Windsor Road, Windsor CA 95492, United States of America. Touch for directions. Other nearby markers. At least 8 other markers are within 8 miles of this marker, measured as the crow flies. Walters Ranch Hop Kiln (approx. 3 miles away); The Wohler Ranch -- 1856 (approx. 3.9 miles away); First Power Commercial Sawmill (approx. 4.9 miles away); March/Heald Flour Mill (approx. 6.6 miles away); Harmon Gregg Heald (approx. 6.6 miles away); Comstock House Restoration (approx. 7½ miles away); Isaac De Turk 1843 - 1896 (approx. 7.6 miles away); Santa Rosa Rural Cemetery (approx. 7.7 miles away). More about this marker. On this marker the organization's name is spelled "Clampsus" which is an early (mid 1800's) spelling. — Submitted April 23, 2012, by Loren Wilson of Sebastopol, California. More. 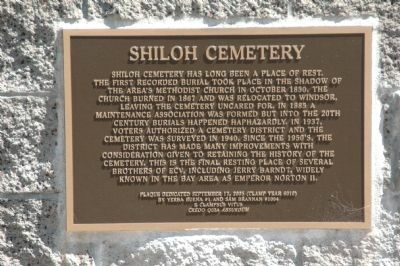 Search the internet for Shiloh Cemetery. Credits. This page was last revised on June 16, 2016. This page originally submitted on April 23, 2012, by Loren Wilson of Sebastopol, California. This page has been viewed 631 times since then and 10 times this year. Photos: 1, 2. submitted on April 23, 2012, by Loren Wilson of Sebastopol, California. • Syd Whittle was the editor who published this page. Editor’s want-list for this marker. Full view of the cemetery. • Photo of the grave site of Jerry Barndt. • Can you help?